A number of devices were used both to detect submarines, and to allow those same submarines to locate their targets without having to surface or raise the periscope. The earliest, and most basic of these was the hydrophone, sophisticated versions of which are still used today. Hydrophones are extremely simple in concept. In the most basic form, a directional microphone is extended into the water through the bottom of the vessel. By rotating the microphone, the operator can listen for propeller and other noises that might indicate a submarine or a target. The louder the noise, the more likely it was that the microphone was pointed at the target. It didn’t take long for the engineers to figure out that a pair of highly directional microphones, separated by a few feet, on a rotating mounting, would be more efficient than a single microphone. With each microphone feeding into a skilled operator’s headset, he could get a more accurate directional fix than by just relying on sound volume. Between the wars, this concept was developed and refined. The American “JP” submarine hydrophone was a simple, highly effective design. Essentially a long, magnetized iron bar with a coil of wire wrapped around it, the back was covered with a sound attenuating material, so that it became relatively insensitive to sounds coming from behind. This was mounted on a shaft, connected to a handwheel in the forward torpedo room that the operator used to train the device. When necessary, the operator could plug the cable into a power source to re-magnetize the core. Sharp blows can demagnetize magnets, so this type of hydrophone can stop working after a close depth charge attack until the core is remagnetized. The JP head was mounted on the upper forward deck in American fleet type submarines. In this position it could pick up the sound of targets and escorts with minimal interference from the noises the submarine itself was making. Also, being on the upper deck, the JP could be used when the submarine was sitting on the bottom. The boat’s other sonar equipment, which was mounted under the hull, couldn’t. One device used to aid the operator in zeroing in on a sound source was the “magic eye” on his amplifier panel. This was a special type of vacuum tube, with the top sticking out through the panel. A phosphor coating created a pie shaped image on the top of the tube. Older people are likely to remember these from old FM radios, which used them as tuning meters. As the signal gets stronger, the “pie” gets narrower, until it becomes a line at peak strength. The operator could watch this to confirm what he was hearing. While hydrophones alone could give a bearing on a target, they were severely limited in capability. Range had to be estimated based on variables such as sound volume, which called for a lot of skill and experience on the part of the operator, and usually a good bit of luck as well. Target speed was more easily estimated, as the operator could count the revolutions of the target’s propellers. As long as good intelligence was available on the target, particular propeller pitch, it was possible to make a good speed estimate. Presuming a target’s screws have a pitch of three feet (that is, one revolution will move the target forward three feet), if the screw is turning at 100 rpm the target should travel 300 feet per minute, or 18,000 feet per hour. Divide that by 6,076 (the number of feet in a nautical mile) and you get a target speed of just under three knots. This isn’t very fast, but for most submerged submarines before the nuclear age it wasn’t all that slow, either. A major limiting factor on hydrophones was the speed of their own vessel. Anti-submarine escorts tended to be rather slow, often with a top speed of no more than 18 knots. There were two reasons for this. First , the vessels they were escorting were often even slower, so there was no need for high speed to keep up. Secondly, and most important, the faster they went the worse their detection gear performed. At full speed, passage through the water made so much noise that a destroyer would be more likely to accidentally collide with a submarine than hear it on their hydrophones. It is for this reason that destroyers were only rarely used as convoy escorts once purpose built vessels, sloops, corvettes, frigates, and destroyer escorts, became available. The simplest form of Asdic combined hydrophones with a sound source. The emitter sent out a sound pulse that reflected off the target. The length of time it took for the pulse to travel to the target and return could be used to calculate the range. This is actually the same principle used by an echo sounder to determine depth. During the inter-war period, Asdic was sufficiently developed for the British Admiralty to believe the submarine had been rendered impotent as an offensive weapon. It took only a few weeks of war for them to realize they were wrong, and that it was much easier to acquire and prosecute a target in an exercise than in combat. Of course, anti-submarine forces weren’t the only ones using detection gear. 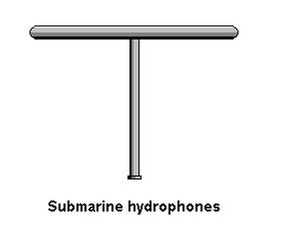 Hydrophones were fitted to submarines very early in their development. Range was significantly enhanced in a sub. The electric motors were quieter than a surface ship’s engines, and operating submerged eliminated surface noises. By the end of World War II, German passive detection gear was good enough to pick up a ship from up to 50 miles away. Asdic/Sonar was a mixed blessing for submarines. It could be used to give an accurate range and bearing on a target, but it also provided a noise source for the escorts to home in on. Radar has always suffered from the same problem. It warns you that the enemy is coming, but it also tells them where you are. The Sonar head in the picture was part of the Sonar suite in an American fleet type submarine, and could be retracted inside the hull when secured. American submarine theorists were so confident in the capabilities of submarine sonar that immediate pre-war doctrine called for all attacks to be made submerged, using only Sonar for targeting. The periscope wasn’t supposed to be raised at all. It was believed that radar was now sufficiently developed that even the slender tip of an attack periscope was fairly sure to be picked up. Once the war started, events changed this doctrine. To begin with, theories aside, none of the captains were ever able to get hits on surface targets using Sonar alone. That didn’t really become practical until wire-guided torpedoes were developed, which allowed the operator aboard the sub to follow the sonar return to the target. Nor did radar turn out to be that good at detecting periscopes. Particularly Japanese radar, which was never very good to begin with. The British claimed that their ability to hunt down German submarines was largely due to radar, particularly airborne radar, but years after the war it eventually came out that their real secret was code breaking. They could find the U-boats because they already knew where they would be. The Japanese did, however, have excellent sound gear, and some highly skilled operators. If a submarine pinged a target, the escorts could hear it and would try to get a reciprocal bearing and attack. For this reason, submarine Sonar is usually used sparingly, generally only single pings for range finding. Submarines do, of course, listen for escorts pinging, which they tend to do much more frequently than submarines. Escorts view active Sonar not only as a way to detect subs, but as a way to warn them to stay away or risk detection and destruction. Modern submarine doctrine calls for boats to be equipped with powerful, highly sophisticated active Sonar, and for that gear to almost never be used. Most detection still employs the modern version of the venerable hydrophone, though it is now linked to a powerful array of analytical equipment and visual displays that give a much clearer picture than just listening. At the same time, operator skill is still the most important factor. Contrary to what turns up in a lot of techno-thrillers, computers don’t do nearly as much as you might think, and operator skill is still a major factor. Through World War II, submarines were mainly used in the anti-surface role. Their initial targets were enemy warships, a role going back as far as Bushnell’s Turtle during the American Revolution. The first successful submarine attack was in 1864, when the Confederate submarine H.L. Hunley attacked and sank the Federal screw sloop U.S.S. Housatonic in Charleston Harbor. The Hunley was also sunk following the attack, the best guess currently being that the crew used up all the oxygen in the tiny hull, lost consciousness, and eventually suffocated. During World War I, Germany quickly realized that submarines made idea commerce raiders. Initially the old rules were followed, ships were stopped, and if contraband was discovered the crew was allowed to abandon before the ship was sunk. That lasted until the British began arming cargo ships, after which the U-boats would simply torpedo them without warning. This was considered barbaric when the Germans did it, but quite acceptable when British subs did the same thing to German merchantmen. Germany was initially even more successful at this in World War II, when the German U-boat force, under Admiral Karl Dönitz, ran wild against an unprepared Britain. Fortunately for the Allies Hitler was a thoroughly land-oriented Führer, and Dönitz found himself with only a fraction of the submarines he considered necessary at the beginning of the war. American submarines in the Pacific actually did manage to virtually destroy the Japanese merchant fleet, though it still took two nuclear bombs to convince Japan to surrender. Today, the primary target for a submarine’s torpedoes is another submarine. The S-Gear (Sondergerät für Aktive Schallortung, or Sound Gear for Active Searching) used aboard U-2317 in With Honour in Battle was a late war German version of active Sonar, using an ultra-sonic pulse frequency that was intended to be outside the frequency ranges detectable by Allied Sonar. (It wasn’t.) The S-Gear employed a round display, similar to that used for radar, displaying targets as dots of light. The submarine itself was always at the center of the display. The operator could watch the screen and determine range and bearing to each target. 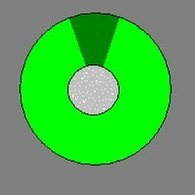 The strength of the echo could be used as a rough indication of target size. A cruiser, for instance, reflecting back more of the signal than a frigate and so showing a stronger return on the screen. Like all bow-mounted Sonar, there was a blind area behind the boat. The S-Gear was designed to be used for submerged attack, and was significantly more useful in that role than pre-war American Sonar. However, it was deployed far too late in the war to have much effect. Coupled with German advances in torpedo design, and the high underwater speeds of the Typ XXI and Typ XXIII boats that were about to come into service just as the war ended, it could have had a significant effect on the Battle of the Atlantic. Normally, the system would be used in the passive mode, using the 48 transducers in the Balkon Gerät (balcony gear) mounted under the boat’s bow, which could detect targets at long distances. This was a more advanced form of the phased array Sonar Germany had developed early in the war, and could be considered the direct ancestor of all modern submarine listening gear.